One goal of the Mars Global Surveyor (MGS) Mars Orbiter Camera (MOC) extended mission is to examine middle- and polar-latitude gullies at the highest resolutions available to MOC. 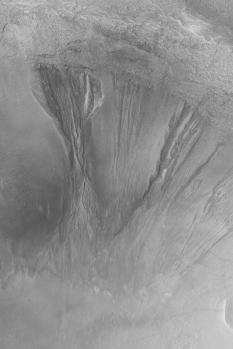 This image, at 1.5 meters (5 feet) per pixel, shows several gullies carved into the material covering the wall of an old meteor impact crater near 46.7°S, 162.3°W. Large boulders that have come down the slopes are present among the gullies and their aprons. The image covers an area 3 km (1.9 mi) wide; sunlight illuminates the scene from the upper left.